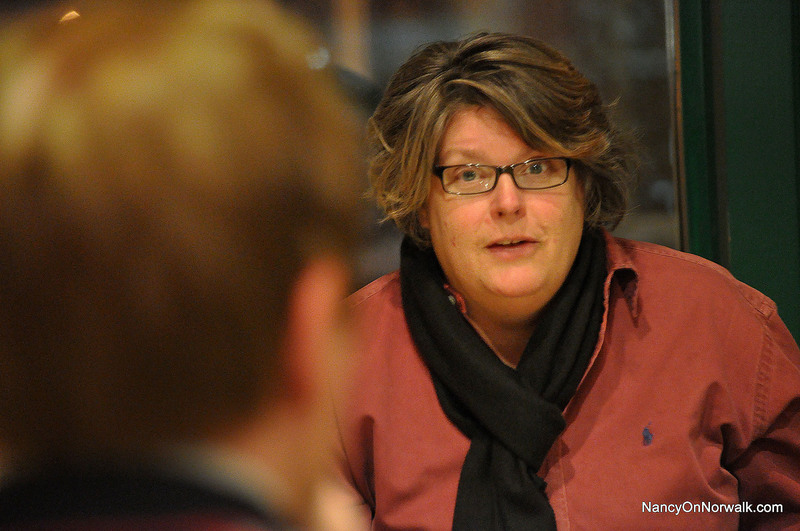 Norwalk Center Task Force Chairwoman Jackie Lightfield . The historic Norwalk Public Library on Belden Avenue, in the First Taxing District. 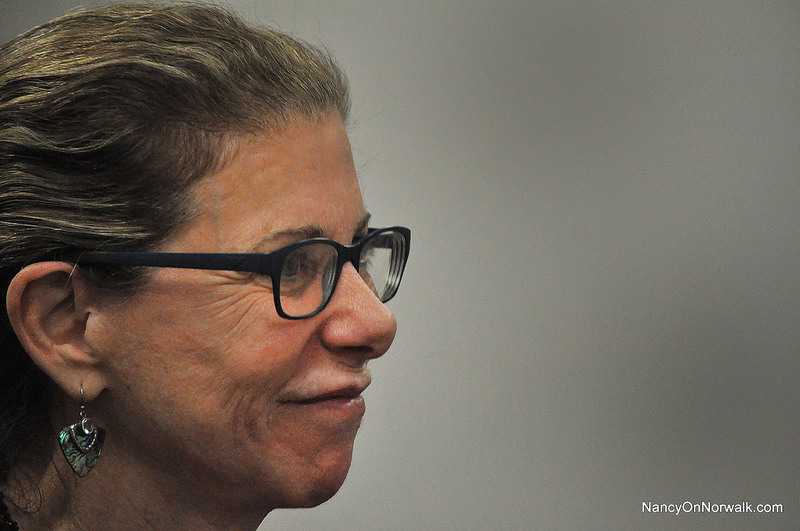 Update, 4:09 p.m.: Norwalk Information Technology (IT) Director Karen DelVecchio refutes Jackie Lightfield comment. NORWALK, Conn. – It’s not that the Norwalk Public Library should move to the proposed mall should the mall get built, Jackie Lightfield said. It’s that a third, more glorious, technologically savvy library space could open in that part of the city, in the strategically placed high-end shopping center. Lightfield has a survey out there looking for support for this idea, which is possible under the new Land Disposition Agreement parameters recently approved by the Common Council. The new LDA mandates that any development built on the 95/7 site at the intersection of West Avenue and Interstate 95 contain 5 percent “public realm” uses. Among the options would be library space – also a square, a plaza, a police substation or a performance area. Lightfield said she was inspired by comments made by Attorney Frank Zullo, First Taxing District Commission chairman and former mayor, at the last Council meeting. “My paranoia index is up a little,” Zullo said, explaining that it had been suggested at a recent First Taxing District meeting that Norwalk’s main library should move from Belden Avenue to the hoped-for mall. 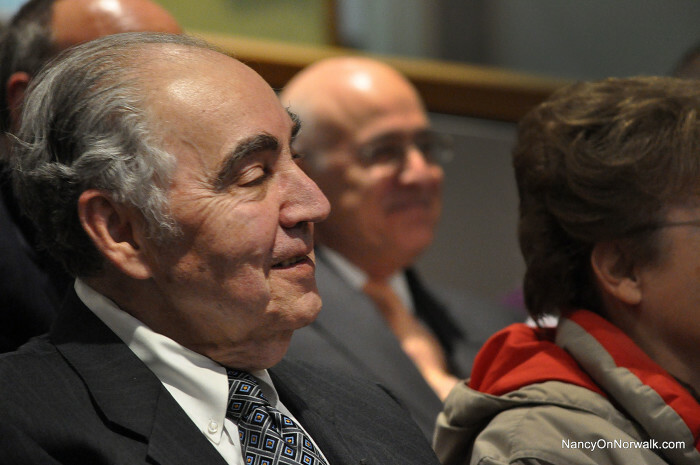 Zullo said there was a study done many years ago – back when he was mayor – that indicated that the Belden Avenue spot was the perfect location for the main library. Former Norwalk Mayor Frank Zullo. Robert Gibbs, a consultant hired by the Norwalk Redevelopment Agency, suggested during a Joint Committee meeting that library space could qualify as a public realm usage. General Growth Properties Senior Developer Doug Adams said his company is not looking to move either the main library or the South Norwalk branch into the mall. Under the new LDA language, the mall would include 57,200 square feet of public realm space. GGP’s plan calls for plazas along the West Avenue frontage for the property, which would be public realm space. Norwalk Public Library Director Chris Bradley. Norwalk Public Library Director Chris Bradley said the main library is 47,000 square feet. The South Norwalk library is 11,000 square feet. “I agree that the main library needs renovation; we have a capital project for a main library building plan so that we can proceed responsibly and in the best interests of our patrons. The South Norwalk branch is beautiful and was just renovated seven years ago,” Bradley said in an email. Turns out that Lightfield set Zullo’s “paranoia” in motion. “The sense of the meeting was that the Board of Commissioners had real concerns about the concept,” Zullo said at the Council meeting. GGP has explored what a library building requirement conceptually could be, Lightfield asserts. “They determined that a 30,000-square-foot floor atop the proposed mall could be built for an additional $9 million dollars. The concept for the dedicated library floor opened on a large terrace overlooking the Long Island Sound, doors accessible from the mall and from the exterior, and a large, flexible, natural light-filled space that could accommodate the modern needs of today’s Norwalk residents,” she wrote in her Norwalk 2.0 press release. Today libraries are reinventing themselves as 21st century information centers. The types of information services that Norwalk needs are changing rapidly. Workshops and studio space to allow for 3-D printing classes, health and fitness workshops, job skill programs, lectures, exhibits and many other services place demands that go well beyond the storage and circulation of books, digital media and periodical materials which Norwalk’s two library buildings struggle to accommodate. The City of Westport is undertaking an expansion to 67,800 square feet, the third expansion in 20 years, to the tune of $40 million and including a 300-person flexible auditorium. The recently completed new 54,000-square-foot library building in Darien cost $27 million and is light filled and fully automated. The Darien Library has 21 wireless access points, a “power library” in the basement full of public access computer and a room dedicated to all office needs. The “Teen Room” offers computers and technology for the younger generation. There is also a self check out that is computerized. The Hennen’s American Public Library Rating system ranked Darien Library as one of the top 10 libraries in the country for its size. The library is one of the busiest in the state of Connecticut with an average day of 1,300 people walking through its doors. We don’t need this, stop comparing Norwalk to Darien. How is it that Ms. Lightfield can read Mr. Zullo’s mind? “Frank Zullo is very much against the idea of Norwalk ever getting a new, modern library” sounds rather insulting. The survey asks “are you in support of or against the idea of getting a brand new library building at the mall?” but it does not address how much this would cost taxpayers. Are we supposed to believe that the mall developer would give the entire library for free? Not only providing the space rent free, but the furniture, fixtures & equipment? Utilities? Cleaning, maintenance, repairs? Staff? I don’t see how anyone can answer the survey question without first knowing the cost. Unless GGP is funding the entire package at no cost to taxpayers, the survey question is moot. I prefer to keep South Norwalk Library just were it is. My children can walk, not in some crowded mall. Its more one on one also. Jackie isn’t saying, “build the library, tear the main library down”, she’s asking the community to answer a survey and weigh in on the idea of having re-thought 21st century library facility (or branch) at the proposed mall location. Secondly, what’s wrong with bringing up new ideas or proposals to the community for input? We see the same names making comments, bashing ideas without asking important questions in the name of “that’s the way Norwalk has always been”… Why change something that’s not broken?… What about forward thinking? What will keep good people living and giving back to Norwalk? No one is saying the library system as it stands now is not making a great contribution to our city. They’re doing the best job they can with the budget they have. But the city is in a position to negotiate an LDA with a developer. Jackie is saying let’s have a discussion about the services the community could benefit from having in the future. Her suggestion is a library, and she thought enough about the idea to bring it to the library board. What other suggestions do people have? Or will this be another lost opportunity for meaningful discussion in our community? Everyone would like to have better parking at the main and South Norwalk locations. That’s not an easy problem to fix. Many would enjoy and support enhancing the historical value of the building. Some may wish to have a community space with evolving technology access. Where do Norwalk residents go for that true multipurpose community gathering? Where do our teens go? Hey, they will probably go to a mall! 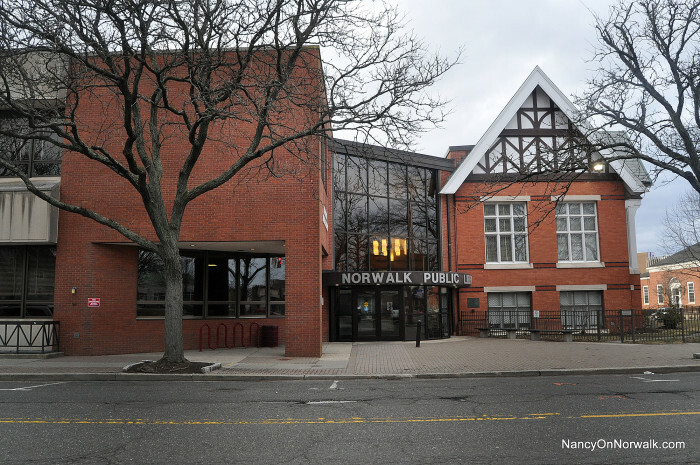 What if there was a community space for them to gather, learn, share ideas and become great citizens and lead Norwalk into the future generations? Not to beat a dead horse, but a recent Norwalk Superintendent applied for a 21st century learning commons grant in our middle schools. Someone in the community thought a lot about 21st century learning. Oh right, he’s no longer here either. Or will this be another lost opportunity? Frank Zullo’s comments to the Common Council last month, as seen on the videotape of the meeting, seem to contradict Jackie’s statements. However, I don’t know what he said in her personal conversation with him. I also find the discussion about the roles of the districts and the city in library affairs confusing. The best, and most readable, history of the Carnegie libraries is the 2013 “Norwalk’s Carnegie Libraries” by former librarian Isabel Bullen. Overall, I’d say the existing libraries serve their communities well, and can be brought to 21st century standards to additionally meet the needs of the new neighbors moving into the expanding housing. I think the Mall is potentially a great link between Norwalk and South Norwalk and will help unite the city as wasn’t done by the consolidation. The trick is to not leave the Norwalk downtown behind. The library can be a cultural anchor to help enrich that part of the city as well. What is it with Norwalk and ANY ‘out of the box’ thinking? There is NO move to get rid of the existing libraries – although it would be nice if there was better parking; but I digress. I think what Ms. Lightfield was trying to convey are the different possibilities of what the public space could be used for – coupled with future trends in libraries. One would think more multi-purpose space with views of the sound would be great when linked with the other city libraries yielding a better more innovative product – but then again, this is Norwalk where territorial and district tribalism shuts down any innovative thinking. It’s unfortunate that it comes from a former mayor. Ms. Lightfield, don’t give up the fight to pull Norwalk out of the 19th Century 🙂 at least someone has vision in this town! If the library works at the mall and cost nothing for the taxpayers fine, but also keep the South Norwalk Branch!!!! If there is an opportunity to include a new branch library in the proposed mall, it may well be worth exploring with an eye on the cost of maintaining another branch. Librarians can’t afford to work for nothing, either. Sorry Jackie, but I think you are just stirring the pot up a bit. That’s kind of what you do professionally anyway isn’t it? A library (no matter how “specialized”)in a shopping MALL is definitely mixing apples and oranges. I think it would be useful if Chris Bradley could comment on whether he believes the existing capital project will give the library system the floor space and facilities it needs. If more floor space and facilities are needed, is it more efficient to further expand the existing building or to build a third library? What would be the likely cost of staffing and equipping a new library vs expanding the existing main library? I agree that updating the Libraries with more technology is overdue but, I also agree with Mr. Zullo. I do not think the Mall is the place for it. This is a threat to the current Library model in Norwalk. There are other factors at play that haven’t seem to be mentioned. Are most aware that the property around the current library has been purchased by a developer? The current library property stands in the way of this developer owning the entire corner. Establishing a Library at the new mall would be the start of the nail in the coffin for the current location. How about a public space at the new Mall for items displaced by the closing of the Norwalk Museum? This could be a great way to tie the past into the future. Love to see that video. Prolly could market it to Vince McMahon at WWF. Hey whatever draws the eyeballs right? I agree Lisa that some manipulate and propagate misinformation for whatever reasons, be they personal, partisan or a cry for mental health treatment. Dismissing the ones not paying attention, yes absolutely, let’s have a discussion what is the best use for all off Norwalk in this proposed project. This is a golden opportunity and thinking minds thank Jackie for beginning the dialog of what we want from this deal with GGP. For those that are stepping in few minute late..
Its not about tearing down a library, its about what is the best use of the space at the proposed mall. Ms. Lightfield has introduced the suggestion of entertaining the idea of supplementing our library system with some high tech multi-purpose library branch for the project. Not a bad suggestion to entertain and more important, is beginning the discussion. Thank you, Ms. Lightfield. The idea of some nearly autonomous, solar, led, high tech, multi purpose space isn’t a bad idea. In fact brings to mind a question, what is the carbon footprint of the is project once completed? How energy efficient will the structure be? Another question is about the proposed tunnel off west ave? Can not envision how this will work efficiently. How will it be constructed so as to insulate from flooding? Vehicle fire in the tunnel? How will that work, and who has liability? GGP? Norwalk? State? Again; This is about beginning a dialog with the entire community of what we want from daddywar bucks. Jackie is basically asking everyone what do you want from the developer? Well?? What do we want? I think Mr. Zullo has misunderstood Ms.Lightfield’s intent. I understand her to be saying to expand the Norwalk Library system not replace it. This concept of public space along the busiest part of the Mall, i.e., try to talk and meet on a plaza where one million visitors per month are driving by or even just normal traffic and you just might become hoarse doing it. A cheap alternative for GGP that does not recognize the needs of a community – dollar driven and Norwalk gets to put up with it because we are so fortunate to GGP or anyone, finally developing the land. A little respect, please GGP. “Plazas” along West Street will not do it. What a brilliant idea, and visionary. Go Jackie! Whatever your thoughts on the library idea, Jackie Lightfield deserves credit for talking about community benefits that could be requested from the developer in exchange for the changes to the LDA that the developer needs. Here we have a deep-pocketed company that wants to develop a mall in Norwalk that will bring the traffic of one million visits per month. Let’s ask for something for the community in return. Something more than the McJobs that our elected officials are so excited about. I would suggest that, if the mall becomes a reality, the “public space” would be the perfect location for something that Norwalk currently lacks — a teen center. Central location, up-to-date space… All that would remain would be to figure out how to convince teenagers to go to a mall. I like the idea. It’s thinking out of the box. The tax payers would benefit from another Library. I’m concerned how this Mall will be benefiting the average citizens of Norwalk especially if it is super high end and the developer gets his way on charging excessive parking fees. We will pay a high price in traffic and use of resources like police, trash, sewer system. This is a tangible way for the developer to give back with real benefits to the city and it’s tax payers. It may not be a bad thing for the developer. It might bring more people to the mall on a regular basis and generate more business. That 5% of public space required would be put to a good use. Good Luck! Bravo Jackie-we are lucky to have someone who thinks outside the box—-people read-we are not replacing any libraries–this would be an addition and one that is needed to bring us into “modern times” a place to read,meet,enjoy the view-great idea-i support it 100%. Jackie — thank you for your creativity and willingness to bring forward new ideas. This one is worth exploring. This could supplement and enhance the current offerings. While the idea is good it leaves behind a dysfunctional main library. Dysfunctional only because it lacks parking. Maybe a better idea would be to trade the 5% community space for GGP to fund the City’s eminent domain taking of the land adjacent to the main library and developing a parking lot sufficient to meet the parking needs of the library. The addition of a new library adds costs to the system that we the taxpayer would have to cover. While I like the idea of a classy, glass-walled library in the mall can we afford it? I would love a Mercedes Benz but a drive a Ford – same utility, less flash. This would be the biggest bang for the buck and have the greatest impact for all Norwalk Citizens. One more point. If I had to choose between paying $3 (minimum?) for parking to visit the Classy Glass Norwalk library or $0 to go to Darien (because I could park there), which do I choose?……Darien. That’s why lots of us already go to Westport, Wilton or Darien Public Libraries. Parking is not an issue, and you don’t have to go to that awful basement. Back to the survey about the proposed mall library. Asking “are you in favor?” without citing costs is just nonsensical. Are you in favor of a beautiful renovation of the Community Room in City Hall? Sure. Are you in favor of spending $200K of taxpayer money for said renovation? Maybe not so much. Did a quick Google search. Seems like a common approach.